Good stuff... Chances are you'll get it again sometime soon and you can use WICreset tool to read the waste counter (no key required for that) to see how soon it's likely to hit. There is currently a person looking for refill advice for a 3880 on DPReview, want me to point him your way? Thanks for thinking of us but right now we're up to the proverbial eyeballs in training and a lot of reorganisation from the ground up so we're swamped. I also don't have direct experience with the 3880 so probably best someone with more hands-on help them out. Cheers though..
Found your link this morning regarding canon mp830 not powering on- "removing the power cord and then uncoupling the power supply unit from the internal connectors, before reconnecting them and replacing the power cord, somehow resets something in the printer and/or the power unit." Can you provide a bit more detail of how to remove to remove/reconnect the PS unit? Thank you for your help. Sorry for the delay in responding.. forum time is currently very limited. 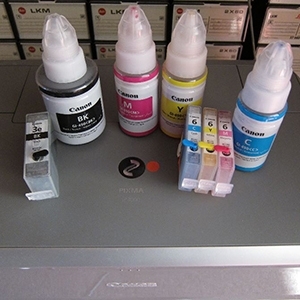 ...for cartridges CLI 251 and CLI 250? Sorry for English using Google translator. We're currently wait for the issues with 550/250 and 551/251 ARC's to be resolved on third party refillables so not got anything except inks resolved for the relevant printers. OEM carts are less than ideal for refilling given physical design too but I can certainly add it to my "take a look at" list once the main work is done. Resolving unplanned expansion issues... ... around my waistline! Negotiating terms for eating food with a keen legal mind... ...aged nearly 4!